Is it ever good news that a pub should close? I remember the Yorkshire Grey here in Sheffield being demolished three or four years ago. It was not a pub I’d enjoyed visiting, and I’d probably end up making greater use of the multi-storey car park built on the site afterwards. But, but, I remember thinking, it’s still a pub. It still makes some people happy. Car parks can never be the source of happiness. They can only lessen frustration. A limiter of the negative, rather than something positive in its own right. Something positive like a pub. And now we’re supposed to celebrate the news that British pubs are being closed down at the rate of 29 a week. We’re supposed to celebrate because 29 is fewer than 52 – which was the rate in summer 2009. That’s still four pubs lost, and bolting the doors against the memory of generations of drinkers, every day. Forgive me if I don’t hang the bunting just yet. Twenty-nine is fewer than fifty-two. But it’s still nothing short of horrific. Similar topsy-turviness can be found in York this week, where the cloud of one pub’s closure could bear the silver living of another staying open. “It seems to be a case of lose a pub to save a pub”, says Kevin Keaveny, the pub preservation officer for the local branch of Camra. “If, by losing the Locomotive, the Volunteer Arms can be saved then that is as good an outcome as we can expect.” Greater love hath no pub than this. So, 29 pubs a week, and losing the Locomotive. A limiter of the negative, rather than anything positive in their own right. Like a car park. 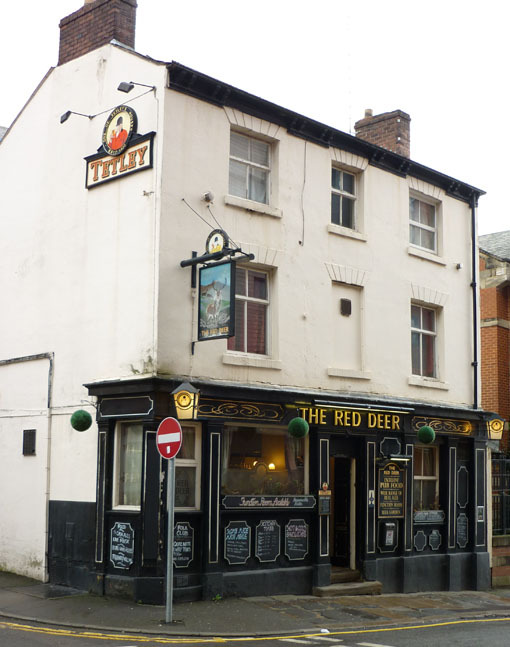 On a freezing Thursday night shortly after ten o’clock, Dan and I edge into the Red Deer here in Sheffield for the first time in yonks. We have guitars on our backs and icicles on our noses. Tonight the pub is doing decent business. There are Americans at one of the adjacent tables. Come to think of it, there are nearly always Americans in the Red Deer. We lean over luscious pints of Batemans XXXB and Harviestoun’s Bitter and Twisted (it must really take some skilful brewing to make such a light beer so full of flavour) and quietly thaw. To be here now is very agreeable indeed. Then again, we’ve come straight from band practice. And after two hours standing in an scruffy unheated room on a bitter November night, even the Yorkshire Grey would have been agreeable. It would have been right near the practice room as well, come to think of it. And that’s why no pub closure can ever be a good thing. The practice is a dress rehearsal (apart from the dress) for our final gig of the year the following evening, down in Nottingham. We tell our friends there that we’ll arrive in Nottingham about five o’clock and see them in the pub. What happens, of course, is what always happens in Nottingham. The part about arriving in Nottingham about five o’clock is true. It’s just that we then spend about an hour and a half driving round in circles while we look for the venue and a parking spot less than half a mile away. And then we get to the pub. All our friends are ensconced at the Bell (featured here), so we squeeze into the room at the front left of the pub. There are entire pubs about the size of this room, and yet this room is only about a quarter the size of the Bell. In the rush and the crush of a city centre Friday, it’s a comfortable enough place to pause for breath between the journey and the soundcheck. The pints and the hugs start to flow. And the popshow, when it comes, is another of these small miracles which sit up in defiance of the terrible times we’re living through. A small miracle that it’s even possible for my band to hop along to another city and play a non-for-profit show with three fabulous other acts, witnessed by 40 or so people, all of us knowing that we’re part of something more vital and real and alive than any proper music industry gig attended by 400 or 4,000. And the Chameleon, with its quirky signs, its steep steps, its character of a manager, its home-spun feel, its home-made and very strong pear and cranberry cider – the Chameleon is the perfect place for this small miracle to happen.